Summary: Over an eight-year period, the National Writing Project created and refined the Analytic Writing Continuum (AWC) Assessment System, originally based on the framework of the Six +1 Trait Writing Model (Bellamy, 2005), for research and instructional purposes. Unlike the holistic scores used in most large-scale writing assessments which offer limited information about how improvements in student writing may be achieved, the AWC provides accurate assessment of both holistic and important performance attributes of writing. Teacher study groups or advanced institutes interested in advancing their knowledge of assessment for writing can use the AWC research brief to draft recommendations and to provide information to school stakeholders. 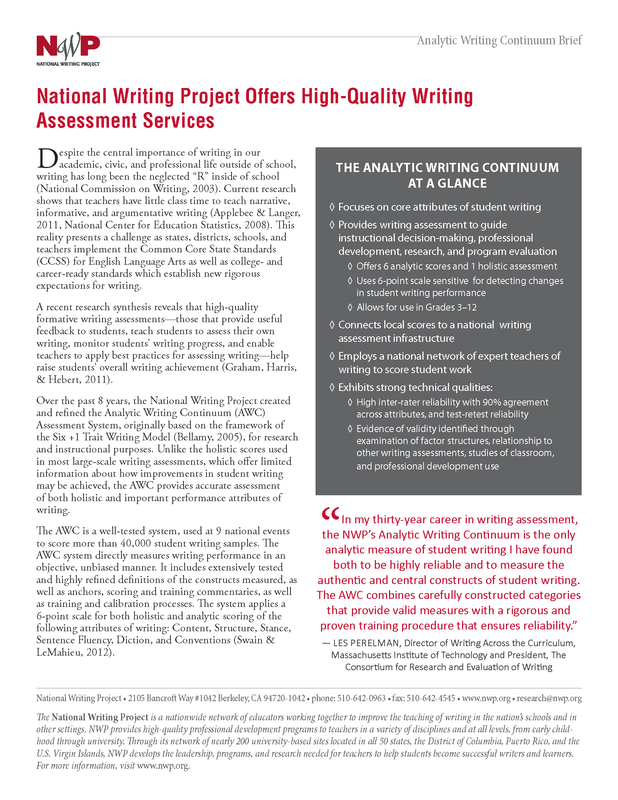 The Analytic Writing Continuum (AWC) Assessment System is a well-tested system that has been used at 9 national events to score more than 40,000 student writing samples. Adapted from the Six + 1 Trait Writing Model, the AWC has been continuously refined over the past 8 years; it is an assessment system appropriate for evaluating the NWP professional development program and providing data to teachers to inform writing instruction. The AWC applies both holistic and analytic scoring procedures, producing a holistic score that is a single summary judgment about the quality of writing, and 6 analytic scores on fundamental attributes of writing: Content, Structure, Stance, Sentence Fluency, Diction, and Conventions. This brief highlights the key features of the AWC assessment system, summary evidence of its technical rigor, as well as an outline of NWP services offered for those wishing to use the AWC.